Do you live in Welaka? 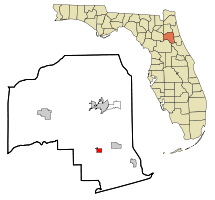 Welaka is a town situated on the St. Johns River in Putnam County,Florida. The population was 586 as of the 2000 census. According to theU.S. Census Bureau's 2004 estimates, the town had a population of 604. The town is part of the Palatka Micropolitan Statistical Area. It is not known when the area was first settled, but the nearby Mount Royal archaeological site is a possible remnant of a Timucua Indian village from ca. 1250 to 1500 AD, and may have a connection to the town of Enacape, an important center of the Utina tribe. The settlement was originally a 500-acre tract purchased by James William Bryant in 1852 and was known as Mt. Tucker. Prior to the war, there were large orange groves and cotton plantations. In 1860, Welaka's population was slightly over 100. At the end of the Civil War, fewer than 20 remained. The town grew again and was incorporated on June 21, 1887 and Welaka was affirmed as the town's name; the name Welaka is said to have been derived from the word local American Indians used for the St. Johns River. By the 1880s, Welaka had become a resort town, marketing itself to visitors seeking medicinal cures from the mineral water of the local springs. The Welaka Mineral Water Company was incorporated in 1907. Welaka is approximately 90 miles south of Jacksonville and is accessible by highway or the Atlantic Ocean via the St. Johns River. It is located at 29°28′54″N 81°40′18″W (29.481556, -81.671555). According to the United States Census Bureau, the town has a total area of 1.4 square miles (3.6 km2). 1.4 square miles (3.6 km2) of it is land and 0.04 square miles (0.10 km2) of it (2.86%) is water. As of the census of 2000, there were 586 people, 276 households, and 173 families residing in the town. The population density was 431.4 inhabitants per square mile (166.4/km²). There were 368 housing units at an average density of 270.9 per square mile (104.5/km²). The racial makeup of the town was 67.06% White, 28.84% African American, 0.34% Native American, 0.17% Pacific Islander, 2.22% from other races, and 1.37% from two or more races. Hispanic or Latino of any race were 3.41% of the population. There were 276 households out of which 16.7% had children under the age of 18 living with them, 47.5% were married couples living together, 12.7% had a female householder with no husband present, and 37.3% were non-families. 31.9% of all households were made up of individuals and 17.8% had someone living alone who was 65 years of age or older. The average household size was 2.12 and the average family size was 2.63. In the town the population was spread out with 17.2% under the age of 18, 5.5% from 18 to 24, 19.6% from 25 to 44, 30.2% from 45 to 64, and 27.5% who were 65 years of age or older. The median age was 52 years. For every 100 females there were 86.6 males. For every 100 females age 18 and over, there were 84.4 males. The median income for a household in the town was $25,069, and the median income for a family was $30,938. Males had a median income of $29,583 versus $20,938 for females. The per capita income for the town was $14,495. About 15.8% of families and 25.0% of the population were below the poverty line, including 38.2% of those under age 18 and 11.1% of those age 65 or over.